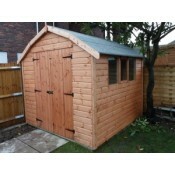 This unusual shaped building is available in four sizes, either 8’ x 8’, 10’ x 8’, 12’ x 8’ or 14’ x 8’. The Dutch Barn is 6’ high at the eaves & 95” high at the ridge. This garden building constructed from tongue & groove shiplap on the four walls & tongued & grooved matching on the roof with a V313 Caberboard floor. The building comes with pressure treated bearers on the floor, toughened glass fitted as standard, a pair of ledge & brace doors with a padbolt & is externally treated with a spirit based preservative. 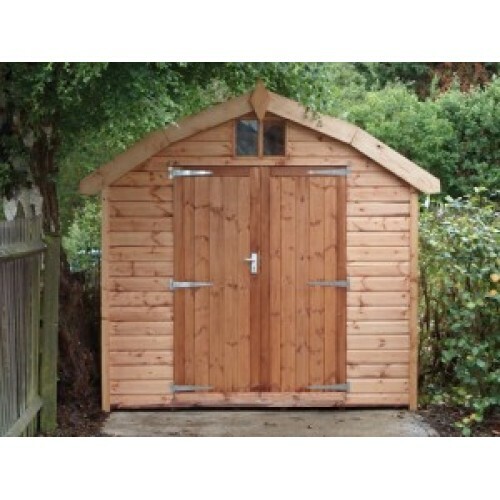 The Dutch Barn Deluxe is dimensionally the same as the Dutch Barn, but with the doors upgraded to a pair of mortice & tenon doors complete with lock & key, an extra window above the doors & a storage platform at the rear of the building.